Is the relationship really over? The answer I got from Le Petit Cartomancien was painfully clear with no room for doubt. The reversed 9 of ♦, shows “Brouille en amour ou en famille”, which translates to love troubles in this context. The reversed Ace of ♠ refers to “Abandon”, abandonment. This bad news will finally be delivered by the “Facteur”. A health-related combination that often pops up around this time of year is the Tree/Bouquet pairing. When looking at someone’s health (Tree), the Bouquet often points to an allergy. There are of course more possibilities but these are the most common types that you are likely to encounter. I always find it challenging to describe art because what it expresses and evokes is in fact ineffable. It touches a part of our souls that doesn’t know how to communicate with words. In my experience it’s nearly always love at first sight and when an artist hits that mysterious spot, it is not uncommon to fall in love, not just with that one piece, but with their whole oeuvre. That is what Carrie Paris does to me. As a matter of fact the very first piece I laid eyes on was the Lenormand Revolution deck. It was out of print when I discovered it so I patiently waited (several years) for its comeback. There was no doubt in my mind that it would be more than worth the wait because I knew it would exceed all my expectations. No, I am not going to review the deck because I think you need to experience it for yourself. Besides, my words could never do the art the justice it deserves. But if you are a traditional Lenormand lover and perhaps also a revolutionary at heart just like I am, chances are high that these cards will hit you in that soft spot as well. The sensory experience that this deck offers is simply out of this world. The card stock is every reader’s dream, sturdy and buttery soft at the same time, which can also be said of the tuck box (yes, I know it sounds weird but you have to experience it to believe it). Thank you so much Carrie for bringing this exquisite work of art back to life! The Lenormand Revolution Deck can be purchased here. Most card reading systems work with specific person cards that can be used to represent the querent or another male or female person. In Petit Lenormand these cards are nº28, the Man and nº29, the Lady. 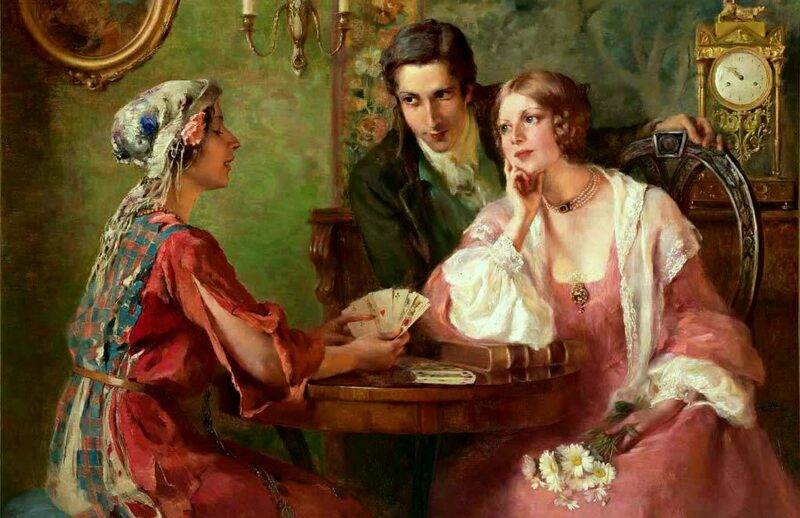 A very simple concept… When you are laying a Grand Tableau for a woman, she will be represented by nº29 and when you are consulting the cards for a man, he will be nº28, the Man. I don’t think anyone will ever question that. A common misconception though, is the idea that the other person card automatically represents the spouse or partner, or future partner when the querent is not in a relationship. While that is definitely a possibility, it is never a guarantee. The second person card in the spread will be described by the cards surrounding it or the area of life that it falls close to. In a Grand Tableau for a lady, the Man might as well be a colleague when the Moon falls next to him, or a sick man or a doctor when he lands close to the Tree. Is there a way to be certain that the other person card will act as the spouse or partner? Yes, but only if you set your intention accordingly before you lay out the cards. I personally only recommend this if there is a specific need to know more about a partner. For a single lady for example, the positions of the Ring, Heart and Anchor will be much more telling in assessing the possibility of a future relationship than the placement of the Man, as he will often just represent a significant male who already forms part of a specific area of her life. The Scythe: proceed with caution! As an advocate of traditional cartomancy and authentic methodology, I think it’s very important to respect the logic of the system you are working with. Card reading implies the understanding of a coded message that needs to be correctly converted into a comprehensible language for yourself or your querent. It is therefore logical to state that a card whose core meaning is negative, can never translate as a positive one. In this vein, the Scythe in Lenormand can’t ever be interpreted as a (positive) harvesting. The Scythe always implies a certain degree of danger or risk. In a Grand Tableau, the risk that the Scythe embodies can be mitigated depending on its distance in relation to the significator and the presence of favourable cards nearby, but it will still express fear or uncertainty. When the Scythe is being followed by a positive card such as the Clover, you could say that the danger expressed by the Scythe will be followed by contentment or small luck. In this case you will “harvest” satisfaction in spite of the risk. Considering the visual aspect of the card, the Scythe’s sharp side of the blade cuts into the Clover, posing a threat or danger to the positivity of the Clover even though the end result will be contentment in a storyboard type of reading. But as you can see, the element of risk is always there. In cases where the Scythe is the conclusive or final card, it would be a terrible mistake to see it as a harvesting of some sort because then you would be turning it into a positive card, which it most definitely is not. The only association that this card has with the harvest is the season that it represents: autumn. ”A gallant man should always honour the ladies for the success of his undertakings. One might think I am merely being gallant when seeing this dedication, but that would only be part of the truth. As a matter of fact, I have an additional aim: our destiny is in the hands of the ladies; therefore it is only appropriate to dedicate a publication to them whose sole purpose is to reflect on the secrets of destiny. There is another reason that leads me to this as well. Often, when a beautiful lady consults the magical cards, she tries to lift a tip of the veil on the future. I hope you enjoyed it and wish you all – ladies and gallant men – a happy Valentines Day!